Nawaz’s sons Hasan Nawaz and Hussain Nawaz are also accused in the case and have already been declared proclaimed offenders for being unable to appear before the court. ISLAMABAD: The accountability court on Friday indicted deposed prime minister Nawaz Sharif in the Flagship Investment Ltd reference filed against him by the National Accountability Bureau (NAB). The judge read out the charges against Nawaz to his legal representative, Zafir Khan. Nawaz Sharif, his daughter Maryam Nawaz and son-in-law Captain (retd) Muhammad Safdar were on Thursday indicted in a National Accountability Bureau (NAB) reference pertaining to Avenfield apartments in London. 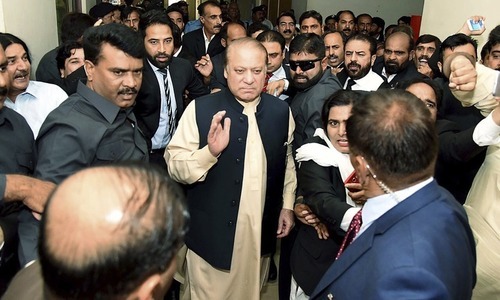 The accountability court on Friday indicted deposed prime minister Nawaz Sharif in the Flagship Investment Ltd reference filed against him by the National Accountability Bureau (NAB).